Many businesses eagerly obsess over things like generating traffic, boosting conversions or making their site look appealing, but very few actually consider the credibility of their website. Does website credibility even matter? Apparently, it does. Research shows that 34% of consumers cite a store’s reputable brand name as their main reason for shopping with a brand. Studies have also been published that reveal a correlation between brand credibility and consumers’ decision to purchase from a brand. In short, the more credible your brand, the more sales it will generate. Available data shows that 78.9% of websites have no SSL certificate or an invalid SSL certificate. This is quite interesting, especially considering the fact that having an SSL certificate won’t just boost sales and traffic but it will also boost your credibility. Research has shown that enabling SSL on your site — having that “HTTPS” in front of your website address and having visitors’ browsers show them a green padlock whenever they visit your site — can boost conversions by as much as 87%. PaperCheck experience an 87% increase in signups after enabling SSL on its site. Central Reservation Service (CRS) experienced a 30% increase in sales simply by enabling SSL. Fitness Footwear, Ltd. experienced a 13.3% drop in cart abandonment and a 16.9% increase in sales after enabling SSL. As you can see from the above examples, enabling SSL will always translate to sales; when people see the padlock and green bar, they feel more secure when performing transactions on your site and they naturally trust you more. The improved perception of your credibility eventually affects your sales. Very few businesses have a security trust seal on their website, and the consequence is that they are losing a lot of sales. Research shows that a whopping 48% of people will not fully trust a website that does not use a security trust seal. In fact, it was revealed, that people trust a site that has a trust seal over a site that has been used in the past by a friend, colleague or family member. This makes sense considering the fact that the web is infested with viruses, and we pretty much hear about new hacks on a regular basis. Having a trust seal shows that your site has been vetted by a third-party security company, that your site has met some standards, and that users can securely perform transactions on your website. 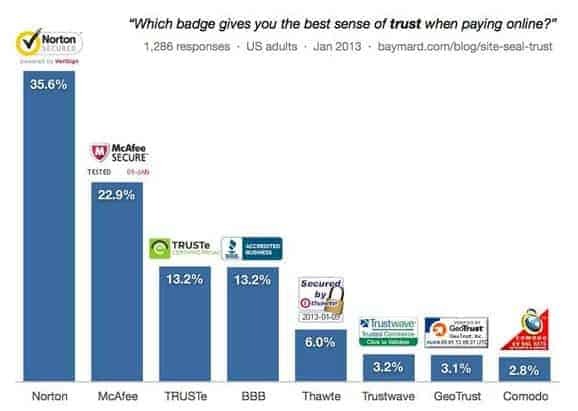 That said, the most trusted trust seals are Norton (at 35.6%), McAfee SECURE (at 22.9%) and the TRUSTe (at 13.2%), respectively. Research shows that testimonials and word of mouth recommendations influence up to 50% of all purchasing decisions, yet only a third of businesses actively seek customer testimonials. There’s a popular saying that nothing attracts a crowd like a crowd. No one wants to be a lone wolf. This fact is actually rooted in psychology, and it has to do with how our brain is wired. According to a study published in the journal Current Biology, it was observed that the area of our brain that is associated with reward is more active when others agree with our opinions. The psychological explanation of this is due to mirror neurons in our brain; a mirror neuron is a neuron that “fires both when an animal acts and when the animal observes the same action performed by another.” Psychologists have observed the presence of mirror neurons in humans too, and it’s been established that the mere act of seeing others do something can influence us to do the same. Famous psychological studies such as Jenness’s 1932 Conformity experiment, Sherif’s 1936 Autokinetic Effect Experiments and Asch’s 1955 Conformity Experiments all point to the fact that, even if people already hold a view about something, hearing a group of people hold a different view is likely to make them gravitate towards the group’s view. This, in essence, is the science behind testimonials; the fact that other people — like potential users of your brand — trust and recommend your brand is enough to make people trust you, too. Just like testimonials, user generated content has also been observed to boost credibility and, as a consequence, improve sales. In 2009, clothing brand Burberry launched The Art of the Trench — its website that allows users to upload and comment on pictures of people wearing Burberry products. The social proof effect of this was so significant that it resulted in a 50% year-over-year increase in sales following the launch of the site. Coca Cola first launched it’s “Share a Coke” campaign in Australia in 2011 — it’s campaign that brands Coke bottles with customers’ names and then asks them to share pictures of their personalized coke bottle on social media. This was immensely successful, and, seeing the success of the campaign, Coca Cola expanded it to the United States and other parts of the world. The results? A 2% increase in Coca Cola sales in the U.S. after more than a decade of dwindling revenues. Greek yogurt company Chobani leveraged user generated content in 2009 when it asked loyal customers to submit videos and images praising its yogurt. The content was then extensively promoted by Chobani. The result was a whopping 225.9% increase in revenue between 2009 and 2010. User Generated Content is one of the best forms of credibility booster for your business. Not only does it tell people that a lot of others use your products and services, it actually lets those using your products and services tell the world in their own voice how amazing you are. We’re growing increasingly impatient, and a lot of research attests to this fact. Perhaps the most notable is a 2015 study by Microsoft Corporation that surveyed 2,000 people and studied the brain activity of 112 other people with electroencephalograms (EEGs). It was observed that our attention span has shrunk massively from the 12 seconds it used to be in the year 2000 to 8 seconds now. In contrast, we have a shorter attention span than a goldfish — which has an attention span of 9 seconds. What does speed mean for credibility, however? A whopping 51% of shoppers will abandon a purchase due to slow site speed. 88% of shoppers are unlikely to return after a bad experience. Around half of shoppers develop a less positive perception of the company involved. More than a third of shoppers will tell others about their disappointing experience. This, in turn, results in great brand damage and seriously affects your credibility. While seemingly simple, boosting your site speed is one of the best things you can do to boost your website and brand credibility. The solution, therefore, is to tweak your site for improved performance or get a better web host. We are suggesting InMotion Hosting, here’s why. Research has shown that one of the greatest ways to ensure compliance is a request coming from an authority source; in fact, it was observed that most people will comply with instructions from authority figures even if it means causing fatal harm to someone else. Imagine getting advice from your doctor, lawyer or a law enforcement agent; how serious are you going to take their words compared to someone else’s? Perhaps the most famous study on compliance and obedience to authority was The Milgram Experiment. The experiment was conducted by Yale University psychologist Stanley Milgram with the objective of observing people’s reaction when asked to do something by an authority. It involved ordinary people who were invited, through a newspaper advert, to administer electric shocks to other people “like them” based on instructions from an authority figure. It was observed that, even after the people who were being electrocuted were no longer responding (an indication that they might be passed out or dead), a whopping 65 % of participants in the experiment continued to administer the shock as long as they were instructed to do so by the authority figure. This goes to show how much we trust and are willing to do something, often without questions, if asked to do so by an authority figure. 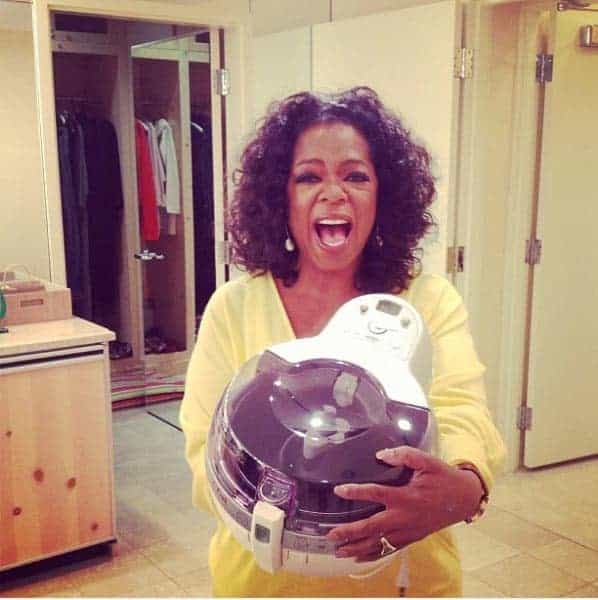 A more recent, and relatable, experience of the influence authority endorsement can have on credibility is “The Oprah Effect.” Basically, anything Oprah endorses turns to gold. More recently, her simply buying a stake in the Weight Watchers brand increased its stock value by 170% almost overnight. Want to boost credibility on your website? Get an authority figure to endorse you. A careful look at most websites reveals few negative or even slightly unpleasant things people are saying about the brand — as if it’s all perfect. While it’s only natural to want to highlight the best things people are saying about your brand, it is not necessarily the most prudent thing to do in terms of credibility. Research by Reevoo found that bad reviews can improve conversions by 67%; visitors are more likely to trust your brand if they see a balanced combination of good and bad things people are saying about you. It was also observed that as many as 30% of people suspect censorship or fake reviews when they only see positive things about you. Tuscan, a wine that costs $60 per bottle, experienced a 5% spike in sales after a popular reviewer likened its aroma to stinky socks. Shake Weight, a vibrating dumbbell, wasn’t only widely ridiculed in the media, but it was at a point called “the most ludicrous fitness gadget of all time” by one newspaper. The result? Over $50 million in sales. Marketing experts Jonah Berger, Alan T. Sorenson and Scott J. Rasmussen, in an experiment observing sales pattern of around 250 works of fiction reviewed in the New York Times from 2001 to 2003, found that bad reviews caused sales for books by unknown authors to rise by an average of 45%. Whether it has to do with your endorsement of other brands or endorsement of your brand by others, letting people see a few “not-so-positive” things that have been said about you will go a long way to boost credibility. For the owner of an e-commerce website, credibility is of utmost importance in terms of increasing sales. These 7 tips neatly do the trick. Do you have any advice you could add to this list? John Stevens is an hosting expert and CEO at Hosting Facts. When he’s not reviewing his favorite web hosts, he’s probably strategizing how to make his beards grow longer.